Students will be able to write a personal report. 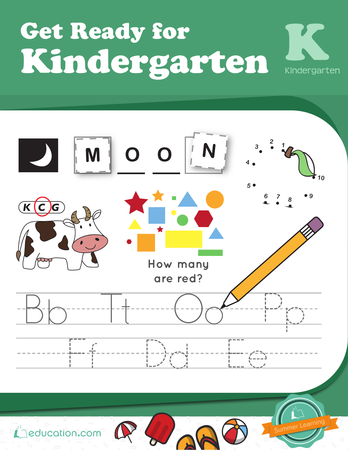 Students will be able to practice neat handwriting. 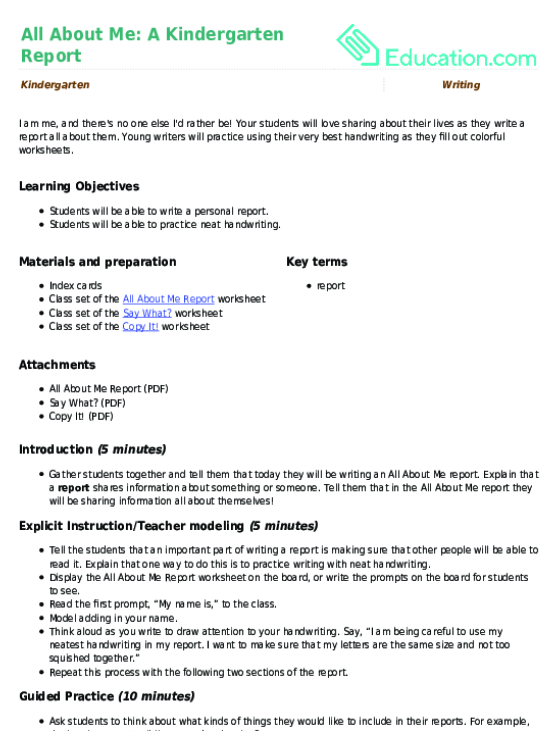 Gather students together and tell them that today they will be writing an All About Me report. 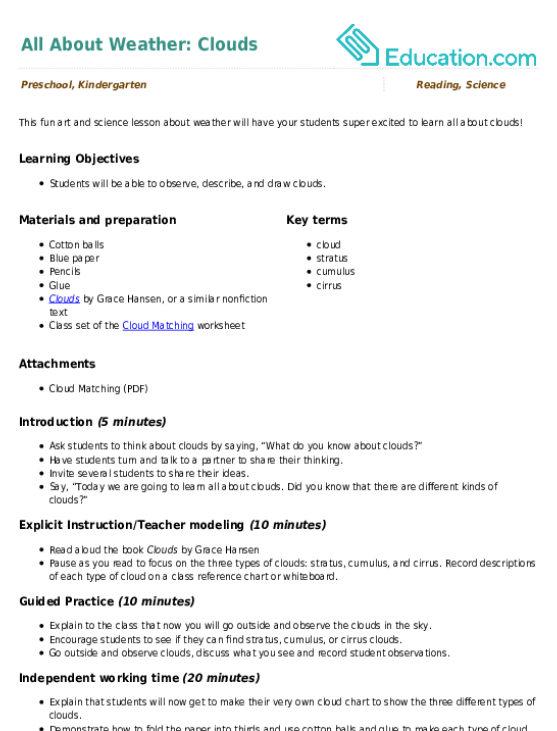 Explain that a report shares information about something or someone. Tell them that in the All About Me report they will be sharing information all about themselves! Tell the students that an important part of writing a report is making sure that other people will be able to read it. Explain that one way to do this is to practice writing with neat handwriting. Display the All About Me Report worksheet on the board, or write the prompts on the board for students to see. Read the first prompt, “My name is,” to the class. Model adding in your name. Repeat this process with the following two sections of the report. Ask students to think about what kinds of things they would like to include in their reports. For example, do they have a pet, sibling, or enjoy dancing? Have students turn and talk with a partner about their ideas. When finished, ask a few students to share one thing their partner told them they would like to include. Record student ideas on the board (include simple drawings next to each idea to help students ‘read’ each word). Pass out index cards to each student. Explain that before writing their reports, they will get to practice writing out some of the things they want to include. Encourage students to choose two things from the board and write them on each side of the index card. Tell students to practice using their very best handwriting! Have students return to their seats with their index cards. 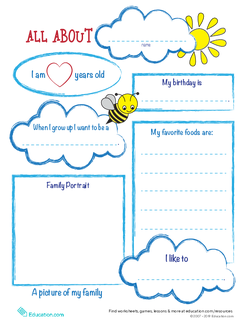 Pass out the All About Me Report worksheet and have students complete the report independently. 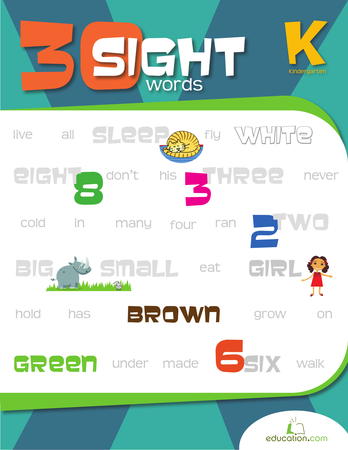 Provide reading and spelling support as needed. Students who finish early can complete the Say What? and Copy It! 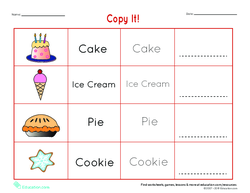 worksheets. For struggling students, provide them with additional pre-written words to copy for each section of their report. Encourage the use of illustration to complete the sections of the report and dictate their writing to you. For more advanced students, encourage them to write additional sentences in each section of the report. Collect student reports and assess whether students were able to use appropriate details and neat handwriting. 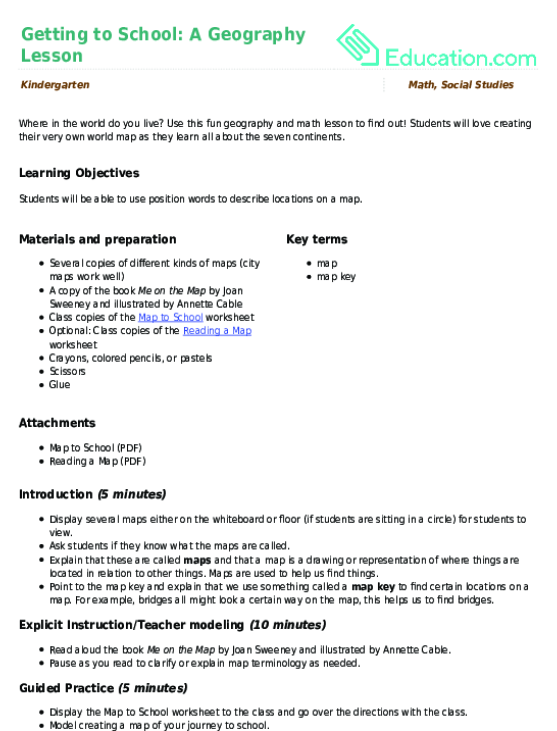 Gather the class together and invite several students to share a page from their report with the group. Ask students to notice the new things they learned about their classmates as they listen to each other's reports. Celebrate the unique nature of each student as they share about themselves. Display the reports in a prominent area of the classroom for others to enjoy. This creative worksheet asks kids to draw and write all about their neighborhood. Let's learn all about the word "sloth"! 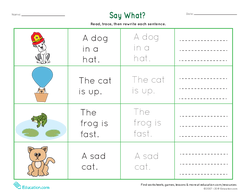 First kids will trace the letters that make the word, then they will use sloth in a sentence, and finally they will draw a picture to go with their story.